Gypsy Scholar: The Universe: A Safe Place? The Universe: A Safe Place? A crucial word . 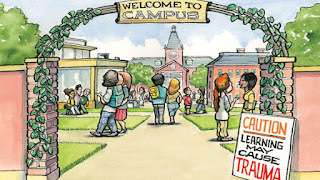 . . [on campuses these days] is "safe". Campus activists have stretched the meaning of safety from an important but second-order concern - shielding students from serious harm - to a defining ambition for any well-run academy. From town-sized public universities to tiny liberal-arts colleges, students have declared and administrators accepted that teachers or visiting speakers should aim for a psychologically safe learning environment, avoiding ideas or imagery that might prove distressing. 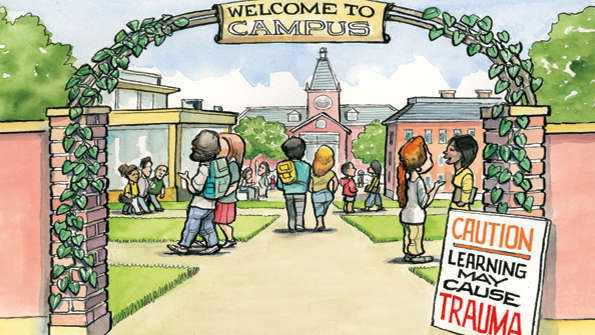 Activists sometimes organise campus "safe spaces" where students may flee alarming material. Door-stickers denote full-time safe zones for specific groups, such as gay and transgender students, or religious non-believers [i.e., non-religious people]. Demands have multiplied for "trigger warnings" - a device first seen in self-help and feminist internet forums, signalling content that may trigger painful memories - to be applied to challenging books, films or lectures. [Critics] see a reap-what-you-sow irony, as politically correct culture warriors of the 1980s and 1990s are devoured by their own heirs . . . . An online essay headlined "I'm a liberal professor, and my liberal students terrify me" went viral. At root this is a fight about power, with feelings wielded as weapons. Students should beware of winning too many victories. A perfectly safe university would not be worth attending. I spent three years at a university where the social studies group criticized the philosophers group for daring to question political correctness! "But . . ." I wanted to exclaim, "but that sort of questioning is what philosophers are supposed to do!" To their credit, the philosophers shrugged off the complaints and questioned political correctness anyway, so I didn't need to do any exclaiming. Anyone who reads my blog regularly knows my view on free speech: entirely for it. I've not taught in American universities since the 1980s, so I don't know how accurate this Economist article is, though I suspect there's some exaggeration about students' views on restricting free speech. But I'm willing to hear from readers with firsthand experience . . .
'Cradle Christians' - Going? Going? Gone? If there be pineapples, why not peachapples?